I can barely suppress my excitement at the publication of Euphoria Tapestry Quilts. It is immensely self-satisfying to see it as the book it was always intended to be. Creative projects develop and change during their gestation but Euphoria resulted in exactly what I had hoped for. Maybe the final result is even more show-stopping and reward-winning than I had dared to hope at its outset. Euphoria was lucky enough to pick up many major awards at IQA Houston World of Beauty, AQS Lancaster, Quilt Canada, and Festival of Quilts in the United Kingdom. Up until Euphoria, I designed all my quilts as I went along, during the the appliqué process itself, sewing appliqué directly onto the background. Each quilt would evolve a little bit every day. This design process worked well for my signature style of filling backgrounds to bursting point with flowers, tendrils, and leaves. I never drew out or really considered the designs beforehand, and although I loved the results of my flower-filled quilts, I felt ready for a change. We had arrived at a new overseas posting and with time on my hands it seemed an auspicious time to try new techniques. I considered a quilt made up of panels that could be joined in a variety of configurations to make a really large quilt. Furthermore, it would be much easier to sew with no huge pieces of background fabric to manipulate during the hand appliqué. I became very excited at the prospect of designing the whole quilt so that each panel could work as a quilt, pillow, and panel in its own right. Loving my sofas strewn with my signature appliqué pillows, I found the prospect of a whole pile of new pillow designs very appealing. In order to make this idea work, I found it easiest to draw prospective designs out on paper first. I loved the challenge of making each of the individual designs work no matter whether its orientation was vertical or horizontal. I also decided that for the first time I would not rely on the fussy cutting of printed fabrics to embellish my designs, but that I would make the quilt using exclusively plain fabrics in shot cotton, slubby silks, and taffeta. I chose a rich dark purple-blue shot cotton for the background as the perfect canvas to make all colors sing. The design and making of the quilt itself took well over a year, representing thousands of hours of hand stitching. When I became tired of working on the dark Euphoria background, I would make up one of the panels as a new pillow or table runner to decorate our new house. The whole quilt grew and grew. I spent hours playing around with different configurations of the panels. When I had decided on the final perfect configuration, I sewed the curved border to all the panels. Up to this point it had just been referred to as “the quilt.” I put it on my design wall, stood back, and instantly knew its name should be Euphoria. The exuberance of the colors, the exotic flowers, and the sheer joy of the piece swept me away with delight. 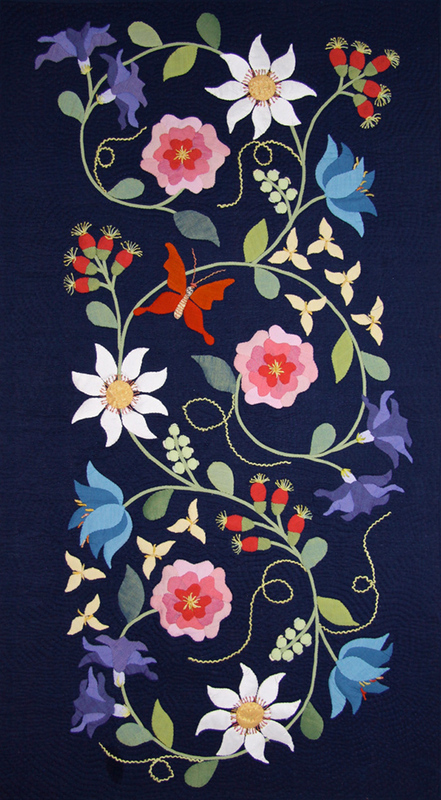 For those quilters who loved my first book, Beautiful Botanicals, this second book gives you a whole new array of flowers, insects, and embroidery stitches to play with. 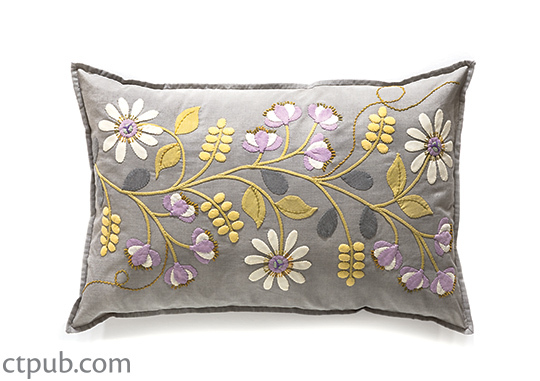 Along with all my new flowers are new pillow designs, panels, and table runner patterns, all of which can be worked as gorgeous projects in their own right or worked to be combined at the end into your very own version of Euphoria. For those intimidated by my love of hand appliqué, hand embroidery, and hand quilting, I can reassure you that these designs are infinitely flexible. They all work with hand appliqué or machine appliqué, hand quilting or machine quilting, and even with no quilting at all. To demonstrate this, I have left some of the projects in the book completely free of all quilting. I find the result is a more contemporary look which appeals to me in 2016 and fit in well with our decor. 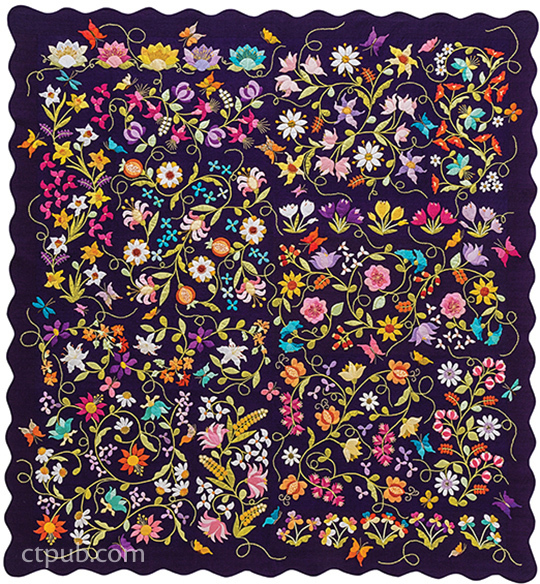 To celebrate the publication of Euphoria Tapestry Quilts, I have designed a simple pillow with some of the new flowers and insects found therein. This pattern can be downloaded for free from my blog. 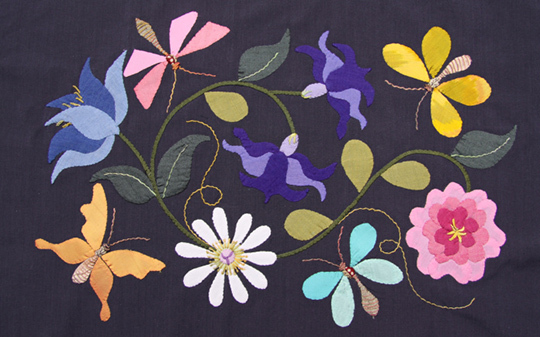 Instructions for the construction of the flowers, insects, and embroidery techniques are all in Euphoria Tapestry Quilts.